Testing Inflation with Hundreds of Fields Concordance or Contradiction? This blog post was written by Marc Manera. More than one million galaxies have been observed in the last three years by the 2.5 meter telescope at the Apache Point Observatory in New Mexico. 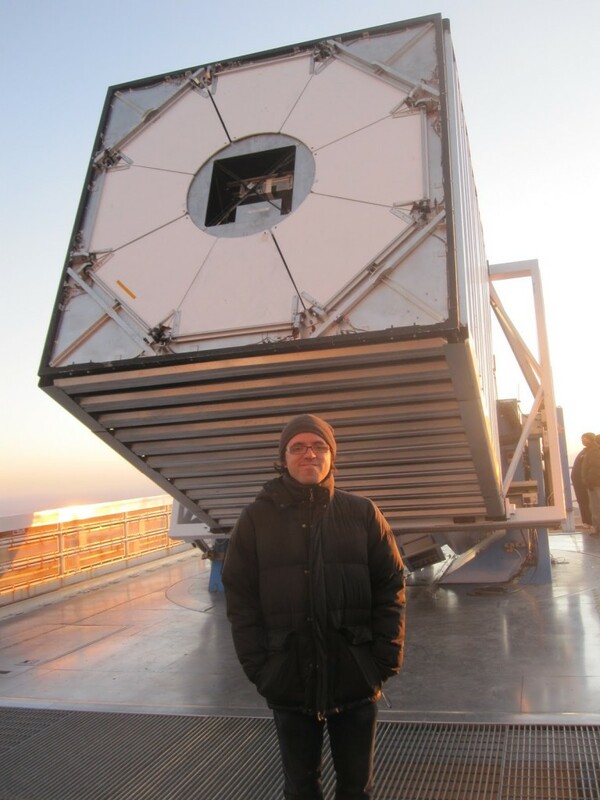 In the picture above you can see the telescope (and me) just before sunset during a visit I made to the observatory some years ago. Some of the astronomers and cosmologists of the Sloan Digital Sky Survey had met nearby to discuss the science that can be done with the forthcoming observations – but now the data are already here. When you have observations of the position and colour of more than one million galaxies at your fingertips, there are a lot of questions about the universe that can be investigated. In this post I will focus on how we have measured the expansion of the universe using the distribution of galaxies from the BOSS survey, which is part of the Sloan Digital Sky Survey. BOSS – the Baryon Oscillation Spectroscopic Survey – has targeted 1.35 million galaxies covering approximately 10,000 square degrees. Galaxies are observed by setting optical fibres in the focal plane of the telescope. The light of each galaxy is then carried to a spectrograph where it is diffracted into a spectrum of wavelengths or frequencies i.e. colours – like a rainbow – and the data are stored. As the light travels from the galaxy where it was originally emitted to us, the spectrum of colours of the galaxies shifts towards the red; i.e., the galaxies appear “redder” than their original colour. We call this change in colour redshift, and we can measure it because we know the colour/frequency of a particular atomic transition as it would have been observed in the galaxies when it was emitted. The magnitude of the colour change – the redshift – is an important cosmological quantity, and tells us how much the universe has changed in size since that light was emitted. If the universe has doubled its volume since then, then the wavelength of the light that we observe will have doubled too. The figure above shows slices through the SDSS 3-dimensional map of the distribution of galaxies. The Earth is at the centre, and each point represents a galaxy, typically containing about 100 billion stars. The outer circle is at a distance of 2 billion light years. The wedges showing no galaxies were not mapped by the SDSS because dust in our own Galaxy obscures the view of the distant universe in this direction. Both slices contain all galaxies between -1.25 and 1.25 degrees declination. As the SDSS map shows, galaxies in the universe are not distributed randomly. Galaxies tend to cluster in groups of galaxies because they attract each other through gravity. Galaxies also have a particular separation at which they are more likely to be found; this separation is set by plasma physics – it is the Baryon Acoustic Oscillation characteristic distance – and we know it is about 4.5 x 1021 km. This is the distance that galaxies “like” to keep between themselves, in a typical sense. In the sky, for each set of galaxies that emitted their light at a particular moment during the expansion of the universe, the typical separation of the galaxies subtends a particular angle. 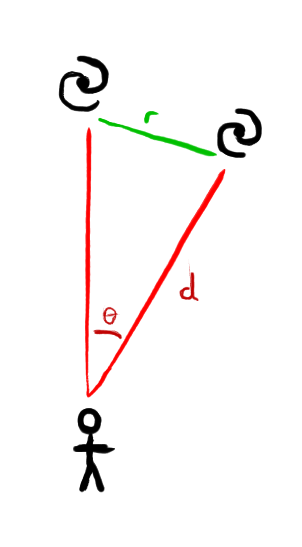 Since we can calculate this separation between galaxies from physics (r) and the angle it subtends by observation (θ), using the basic geometry of a triangle we can work out the distance between us and these galaxies (d). This is illustrated in the final figure below. This shows a person observing two galaxies separated by a typical distance r. If we know then angle θ, we can measure the distance from us to the galaxies. Finally, because the speed of light in constant, we know how long ago the light from the galaxies was emitted, and thus we have all the information we need to deduce the expansion history of the universe. So to sum up, to work out the expansion rate of the universe we select several samples of galaxies; each sample will have emitted its light at a different time, and therefore it is at a different distance to us. We can measure this distance using simple geometry by observing the typical angle by which galaxies are separated. Once we have the distance to each sample of galaxies, we also have a measure of how long ago they emitted that light. 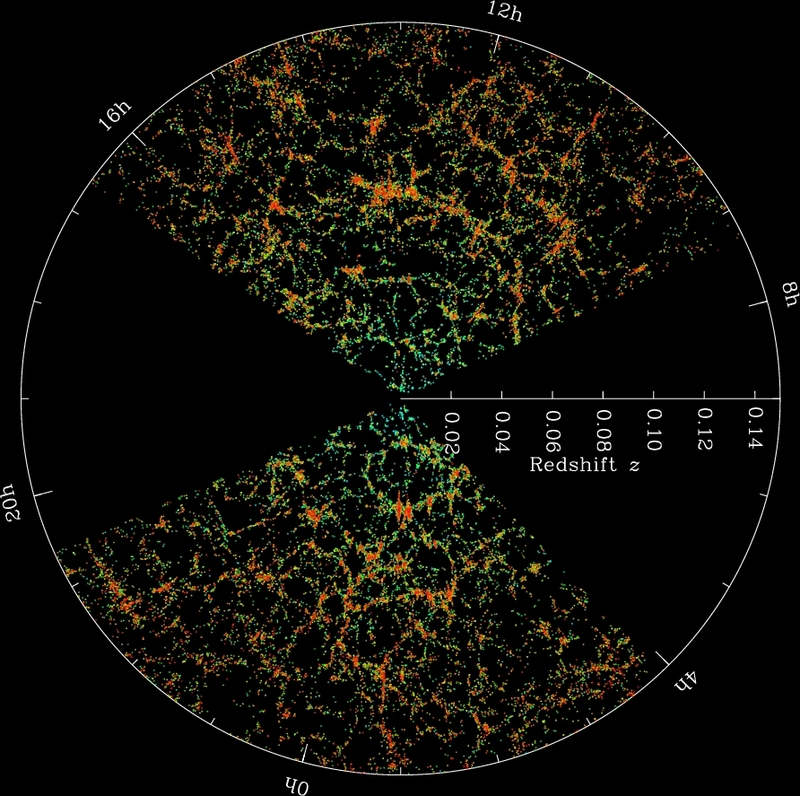 Now, from the colours of the galaxies (the redshift) we also know how big the universe was at that time. For each set of galaxies we know the age of the universe at a particular moment and how big the universe was at that time. We have therefore determined the expansion history of the universe. This is exactly what the BOSS survey has done using three sets of galaxies at different distances.